"Continued progress with emphatic win (by three lengths from Desert Skyline) in Yorkshire Cup on last month’s reappearance..."
Simple task in amateur contest at Killarney last August before placed in Melbourne Cup for second time when third in November. Not at best on return to Flat when fourth to Stradivarius in Yorkshire Cup last time and lot more needed to figure here. Authoritative winner of 2016 Gold Cup and only beaten short head by game front-runner Big Orange last year. Went on to win second Irish St Leger and Long Distance Cup (from several of these rivals) later in 2017 and looked as good as ever landing odds in Group 3 at Navan and listed race at Leopardstown this term. Looks the one to beat. Very lightly raced of late. Ran on late for sixth in 2015 Gold Cup but didn't see race out on softer ground 12 months later. Needed run on first start since in listed race here in May and others have much more solid claims. Veteran who has finished third and sixth in last two Gold Cups. Showed he retains plenty of ability when staying on for length second to idling Vazirabad in Dubai Gold Cup but made no impression in Henry II Stakes at Sandown last time. Likely to be vulnerable to younger rivals. Improved into a smart stayer last year, fifth in Gold Cup before runner-up to Order of St George in both Irish St Leger and Long Distance Cup, only beaten half a length on soft ground in latter. Had been getting weight when beating same rival in Vintage Crop Stakes earlier in 2017. Better than ever when five-length winner of Sagaro Stakes at Ascot in May, again on soft, making all. Capable of going closer than last year. Top French stayer and prolific winner who won third successive Dubai World Cup in March when coming from off pace to beat Sheikhzayedroad. Since won Prix Vicomtesse Vigier at Longchamp, also for third time. Not had much racing on ground firmer than good and trainer hasn't been keen to send him over for this in past years, while he's not the easiest ride either, but potentially a big danger to Order of St George. Highlight of three-year-old season when beating much older stayers, headed by Thomas Hobson and Sheikhzayedroad, in Doncaster Cup. Encouraging third behind Torcedor in Sagaro Stakes here on return before sticking to task well when three lengths second to Stradivarius in Yorkshire Cup last time. Yet to beat latter rival in four attempts, but better off at weights and stiffer test of stamina should suit. Course winner earlier last year and belied huge odds to be beaten two and a half lengths into fourth behind Order of St George, Torcedor and Stradivarius in Long Distance Cup here in October. Returned with game listed success at Nottingham but didn't build on that when fifth in Henry II Stakes at Sandown last time. Has something to find over new trip. 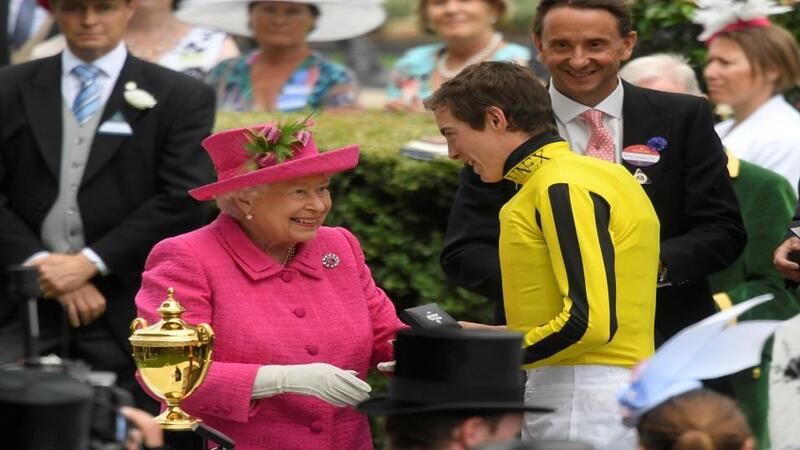 Landed Queen's Vase at Royal meeting last year before gaining rare success for a three-year-old in Goodwood Cup when beating Gold Cup winner Big Orange and ended season with close thirds in St Leger and Long Distance Cup. Continued progress with emphatic win (by three lengths from Desert Skyline) in Yorkshire Cup on last month's reappearance. Only has a length to find with Order of St George from last October and may well improve past him now. STRADIVARIUS is a stayer on the up judged by his emphatic win in the Yorkshire Cup and he can improve past 2016-winner and last year's second Order of St George and take his place at the top table. Vazirabad is the best in the division in his native France and a big danger to all on his first run in the race.